Cardiovascular exercise is one of the core components of an antiaging exercise program, the other is strength training. The best cardio exercise program incorporates fitness interval training for your antiaging program. This is exercise in which the large muscles of the body are used to create a demand for oxygen, which the heart and lungs must work harder to supply. This is aerobic, because the muscles are constantly supplied with oxygen as they are working. Programs for this type of exercise vary a great deal, although they have one goal and that is to raise the capacity of the heart and lungs to supply oxygen to the body, and brain. This is critical to longevity, because oxygen is vital to all tissues. The equipment used for this type of exercise varies. 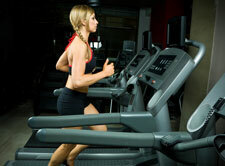 Below are some types of cardio equipment used for conditioning purposes. Each has advantages and disadvantages depending on your individual needs. Rowing Machine also called "ergometer"
Cardio exercise can be done with circuit weight training using machines, barbells, dumbbells, kettlebells, or bodyweight calisthenics. All of these devices can be used for a cardio exercise program. The effects of each type of exercise on your body's hormonal systems is an important factor when choosing how your cardio exercise program fits into your antiaging strategy. Steady state cardio can lower testosterone and raise cortisol if done for too long a time. Testosterone is one of the body’s primary anabolic hormones, and thus it is important to maintain healthy levels of this hormone all throughout life. Cortisol is a stress related hormone and prolonged high levels of cortisol can cause the body to break down muscle tissue and store fat, which is the opposite of what you are trying to accomplish! So the question is how do you get the benefits of a cardio exercise program without the negative effects on your hormonal system. There is where fitness interval training comes in. This type of training is considered anaerobic, which means that the muscles are working without oxygen. Anaerobic exercise consists of short bursts of exercise,and uses glycogen that is stored in the muscles and liver to power muscle activity. While performing this type of exercise, there is a temporary lack of oxygen, so the built in rest periods allow you to take in oxygen and keep going. Intervals are periods of intense effort followed by periods of much lower effort. Fitness interval training has become a very popular for cardio fitness because it benefits both the aerobic and anaerobic systems at once. It is also referred to as energy system training. A cardio exercise program is essential for antiaging. Heart and lung capacity can be maintained in a hormonally healthy way through fitness interval training, so that cardiovascular exercise effectively benefits your antiaging program.